The war for Scottish independence rages on, but it's only a matter of time before England is victorious. 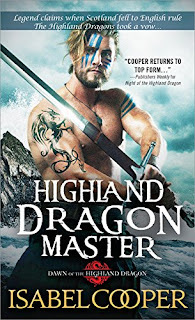 Exhausted and battle-weary, Highland dragon Erik MacAlasdair will face unknown seas to seek the Templar stronghold and claim a power so great it could free his beloved homeland forever. Daughter of a mortal woman and an ancient dragon, Toinette has never forgotten the proud Scot who once stole her young heart—she'll gladly fight at his side. But when dark forces leave them stranded on a cursed island, it will take everything they have to defy their fate...and trust the passion that burns within the heart of every dragon. I hadn't really noticed this series before but man that cover has me wanting to read it. Add in dragons and I'm making grabby hands haha Has anyone tried this series/author before?